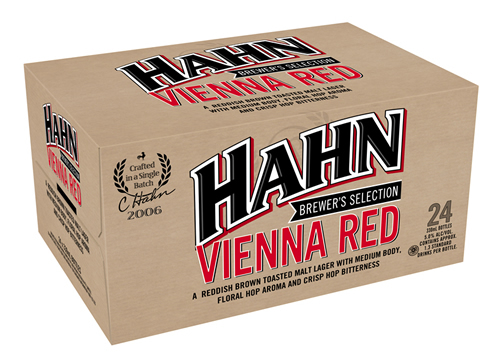 Hahn Vienna Red represents the Austrian side of the lager development.. Whereas Hahn Premium is derived from the Munich Lager development, Hahn Vienna Red represents the simultaneous development done in Vienna with slight darker richer malts. We have doubled the late hopping of German Herbrucker hops, plus added extra darker malts for richer maltiness. Lager as we know it was only invented in the 1840s. Traditionally, all beers were ales - meaning brewed with a top fermenting yeast. This reflects the earliest days of beer, when natural wild yeasts would float down to an open fermenter (which of course, could as simple as a bucket of damp germinated barley) and bubble away. To the best of our knowledge, lager yeasts were only discovered by astute monks in the 15th century, and for hundreds of years lager was a dark seasonal beer - a winter beer, as it required lower temperatures to ferment, and refrigeration hadn't yet been invented. What's more, it had to be stored (lagered) for a longer period before being served (which is why Toohey's Old is actually a younger beer than Toohey's New). Many advancements were made to lager brewing in the 1840s. The highlight is seen as the development of the Pilsner style - golden, light, floral, crisp - a world away from the dark and murky beers that had come before it. This style, helped by quality improvements that flowed from the isolation of the yeast cell in the late 19th century, and the advent of refrigeration, eventually took over the beer world. Australia was an early adopter. England held out till the 1970s. But resistance was futile, and now 90% of the beers drunk in the world are pilsner derived lagers. Given this, people seeking interesting beers - beers off the beaten path, often turn to ales for greater beer complexity. But this need not be the case. For example, in Vienna a fellow by the name of Dreher and his family invented this style of lager in 1841. It is said to be the precursor to Pilsner, which was developed in 1842. The Vienna Red didn't catch on like Pilsner did. But people like Chuck Hahn are working to bring these old beers back to life. The first thing you should notice about this beer is its colour. It's called Vienna Red, but it's not blood red. It's a subtle red. The best way to appreciate the colour is to hold up one glass of the HVR and one glass of, say, a Hahn Premium. Now you can see the red. It is the special roasted malts that do this. It's not usual in a lager. Now have a smell. There is a floral aroma there but it's not overpowering. Then feel the beer inside your mouth. It's thick isn't it. Not as thick as Guinness, but not as weak as a bland, watery lager. That's called mouthfeel in beer-speak, and this beer has some. It comes from all the malt Chuck has used (ie the roasted germinated barley). It's very smooth, so appreciate it. What about the taste? There's a pleasant bitterness (think about the rise at the back of your throat), but it isn't as bitter as, say, that Hahn Premium you were holding up. There's also maltiness from all that malt that gave birth to that mouthfeel. It's a very drinkable beer, but not in an insulting way. If your wife or girlfriend doesn't drink beer (or beer that tastes like real beer), then get her to try this beer. Food For Thought: This beer can be consumed anytime, but would go well with the darker meats, or perhaps after dinner.